How do you build a kitset home? Can you customise kitset homes? What are the typical costs of a kitset home? What are the disadvantages of kitset homes? Are kitset homes an environmentally-friendly choice? 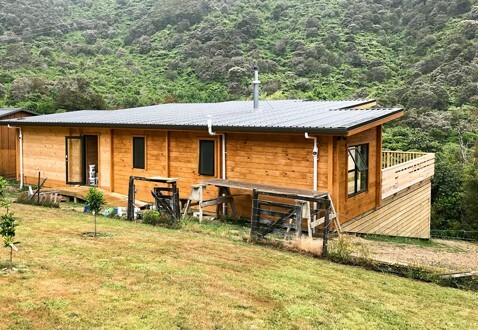 Kitset homes have become a really popular option in New Zealand in recent years, and it’s little wonder why – they’re often extremely cost effective, and the range of designs are increasingly versatile. A real sense of achievement is afforded those who choose to build their own kit house instead of hiring a builder as well. Fraemohs Homes are one of the original kitset home manufacturers in New Zealand, having been founded by Danish immigrant Monni Fraemohs back in 1968. Kit homes had long been popular throughout Scandinavia, and Monni essentially applied the Scandinavian method of kit home design and build to New Zealand, making the most of the unique and abundant natural timber resources on offer. The following information on kitset homes is available for anyone interested in the topic of kit homes. We hope you find it useful; if you would like to know more or if there are any topics of interest you want us to include on this page, please feel free to email us your suggestion and we’ll do our best to include it for you. The great thing about many kitset homes is that you can build them yourself as long as you are reasonably handly and able to lift heavy construction materials. As well as making great homes, kitset granny flats or a kitset sleepout can provide an ideal solution for those looking to build an office to work from home or for accommodating teenagers or ageing parents on your property. If you are not a builder, you may need help from a specialist to tackle the foundation and the construction of the roof. You will also need a registered plumber and electrician to do the plumbing and electrical work in accordance with New Zealand legislation. For example, solid timber kitsets such as those made by Fraemohs Homes have walls constructed of planks of laminated kiln-dried pine which interlock. You don’t need any nails for the walls, just a sledgehammer to fit the pieces together. Each piece is numbered numerically and each wall is marked alphabetically. Laminated exposed roof beams fit neatly with hidden structural brackets to the walls, and the sloping ceilings in the living areas are made from solid pine sarking. To get more of an idea of the construction method, have a look at this video. If solid timber does not appeal to you, you may prefer a kitset that is closer in style to a conventional home such as the Timbermode kitsets produced by Fraemohs Homes. These kitsets are more challenging to build than the solid timber kitsets so you really need some building experience if you are intending to build your home as an “owner builder”. In Scandinavia and many parts of mainland Europe it is very common for new houses to be constructed from kitsets. Here in New Zealand, the wider public is increasingly becoming aware that kitset homes offer a viable option to the problem of affordable housing as they offer a number of significant advantages over conventional approaches to building. One benefit of using a solid timber kitset rather than building from scratch is that solid timber kitsets generally take less time to build than conventional timber or steel-framed homes. This means that you can be in your new home sooner and you can save money on renting or paying bridging finance. Another advantage of kitset homes is that many, such as Fraemohs solid timber homes, give you the option of doing some or all of the building work yourself. This allows you to make significant savings on the labour costs associated with building your home. Because all of the main structural elements of a kitset home are pre-manufactured, there is less wastage of materials and you do not have the hassle of ordering and measuring building materials. Many people ask the question “are kitset homes relocatable”? The answer is that very often they can be, however this is dependant on the type of foundations and materials used. Solid timber homes lend themselves to relocating as you do not have the problem of cracking plasterboard to contend with. Some solid timber homes have even been relocated off concrete foundations, however timber pile foundations are generally recommended if you are considering relocating your kitset home in the future. Do kitset homes make good holiday homes? Many people choose kitset homes when they are building a holiday home. Kitsets are a practical choice because they are quick and easy to build and homeowners who are fit and have a bit of DIY experience can do a lot of the construction themselves. This can be especially useful if your kitset bach is going to be located off the beaten track. 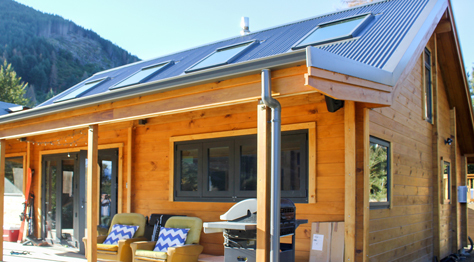 Solid timber kitsets have a traditional timber look that makes them an ideal kitset cabin in an alpine environment such as Hanmer Springs or a beach-side location. As well as looking the part, solid timber kitsets also perform exceptionally well in a range of climates. If you are wanting a less traditional style of holiday home, you may prefer the option of a more contemporary kitset design, such as the Timbermode kitset range produced by Fraemohs Homes. Why use solid timber for kitset homes? One of the many reasons why wood has been used throughout the ages as a construction material is because of its durability and safety. During the Canterbury earthquakes timber-clad houses and solid timber homes performed very well, with many suffering minimal damage. This is because wood has the ability to flex and move if the foundations shift, unlike more rigid materials such as steel, bricks and concrete. The properties of natural timber also help to create a healthier home. 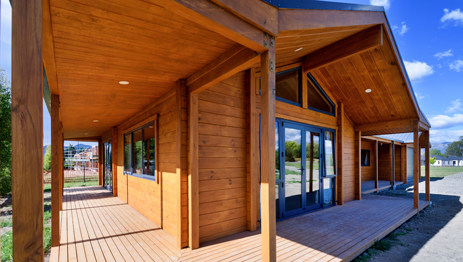 Wood “breathes” in a way that man-made materials do not and helps control moisture levels indoors so that natural timber homes will feel drier, warmer and be easier to heat effectively. Wood’s insulating properties can also help to reduce energy leakage from your home. Timber is a sustainable, natural, renewable resource. Timber lining has an elegance and warmth that makes a home attractive to live in. What are the options for building kitset homes? Some people think that if you choose a kitset home then you have to build it yourself but this is only of many kitset options. You can also choose your own builder to construct your kitset or your kitset provider may have a network of builders that they can recommend. 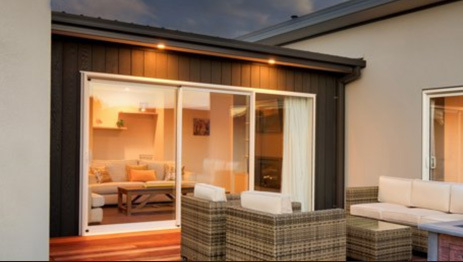 For those looking to build a kitset home in the Canterbury area, Fraemohs Homes offers two ranges of customisable kitset homes (solid timber and Timbermode) with a complete build service. This service can include assisting right from the start of the process with arranging finance, choosing a section and handling all of the consents as well as arranging an experienced builder to construct your home so that all you have to do is choose the fittings and move in. Many people are under the impression that if you purchase a kitset home, you are stuck with the designs available and can’t change the design to suit your needs. While this is the case with some kitsets and prefab cottage products others offer the option of a customised kitset design manufactured to fit your specifications. Some kitset homes come with very basic and fixed kitset kitchen designs. Other suppliers recognise that for many homeowners the kitchen is a very important space. This is why Fraemohs Homes offers a reference kitchen design as a starting point with the option to create a fully customised kitchen design to suit your personal preferences. Are kitset homes an environmentally friendly choice? When considering eco friendly house ideas, the first thing to think about with kitset homes is where you are sourcing your kitset from. If you choose to purchase a kitset from another country you need to factor in the considerable amount of fuel consumed in transporting your kitset across the world. This means that it is likely to be kinder to the environment (as well as much easier) to choose a locally-manufactured kitset option. Secondly you need to find out whether your home is constructed with new sustainable building materials. Fraemohs solid timber kitset homes, for example, are manufactured using sustainably grown New Zealand plantation pine. Unfortunately, however, not all timber is sustainably grown so check that you are not inadvertently contributing to the destruction of rainforests somewhere before you commit to buying an imported kitset. Another thing to consider with regard to eco friendly house materials is how the timber is treated. Some methods of treating timber use metal compounds which can potentially cause health risks if they leach into the environment. Look for an eco-friendly product such as Vacsol Azure which is a non-metallic timber treatment. A kitset home can be a great option if you are looking to build a house cheaply as you can save significantly on both material and labour costs, particularly if you are able to do some or all of the building work yourself. Because the build time tends to be shorter you can also save on rent payments or bridging finance costs during the construction period. Depending on whether or not you opt to undertake the construction yourself, kitset homes can offer average cost savings of 10 to 20% compared to a conventional build. Kit prices vary widely so be sure to look closely at the kitset price list of your chosen kitset supplier to make sure you know exactly what you are getting for your money and that there are no hidden extras. For example, is all joinery included and what about internal fixtures and fittings? Some kitsets include prefab kitchens and bathrooms in the price whereas others are just a kitset shell. What is the difference between kitset, transportable, modular and prefab homes? Many people assume that kitset homes, prefabricated, modular and transportable homes are the same thing but there are some important differences. A prefabricated, transportable, or modular home is constructed in one complete piece, or several large pieces known as modules. These modules are generally fully finished, including elements such as the flooring and fixtures, and are transported on trucks to the building site where they are joined together to form a permanent structure. Unlike prefab homes, transportable or modular homes which are largely built off-site, a kitset home is built on-site using both prefabricated and site installed components assembled in the most efficient manner to minimise the total build costs (a combination of transport, labour and material costs). Because prefab homes need to be transported on trucks, there are restrictions in the size of the modules and the materials that can be used resulting in less flexibility to customise the design. Similarly, many subdivisions have covenants prohibiting the use of transportable homes due to the negative impact on value of the surrounding properties. Your site’s unique characteristics are an important consideration in the layout and design of your home. With a kitset home there is more ability to alter standard designs or even create your own custom design, ensuring that any covenant restrictions can be met and your site’s best features are utilised to their full potential. Kitset homes are not for everyone. While some people like the ability to project manage their own build and construct their own kitset home, this can be time-consuming and does not suit those with limited time or practical skills. However, some suppliers do offer a complete build service for those who prefer not to manage the build themselves. Another disadvantage of kitset homes is that some suppliers offer a limited number of set designs with little or no ability to alter the design. If you have specific requirements in terms of your design, you may need to opt for a supplier that gives you the flexibility to create a customised design. One of the other problems with kitset homes is that they vary in quality so it pays to do your homework before you buy to ensure that you are not purchasing an inferior product with poor quality components that won’t last. Make sure that you choose a supplier like Fraemohs Homes that uses products from reputable New Zealand suppliers with good warranties for your peace of mind. Kitset homes by Fraemohs are available in both Timbermode and Solid Timber.